Version Information Resource Editor: Edit DLL Version Number, Change EXE Version Information. 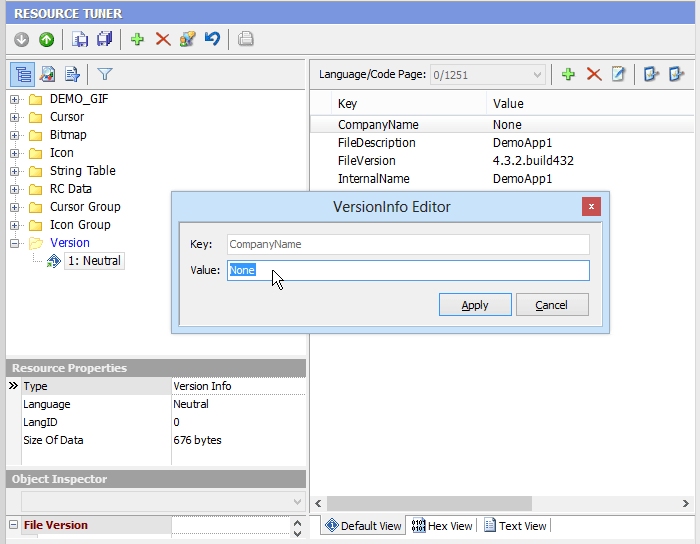 Resource Tuner lets you visually edit, update or delete the Version Information: version numbers, vendor information (copyrights, trademarks, origins), product name and original file name. This information is displayed on the version tab of the property sheet dialog displayed by selecting the "properties" item from the right mouse button context menu in Windows Explorer. With the Version Information Editor, you can maintain this data, which is stored in the version information resource, and make the changes directly in the Version Information table. Resource Tuner offers a thorough look at all of the resources (bitmaps, jpeg, icons, strings, dialogs, PNG, PNG compressed Vista icons, XML, Image Lists, Type Library, etc) in the compiled 32-bit executable file, and allows you to make modifications without needing to recompile the source code.